The HV9961 demoboard is a high-brightness LED driver employing average-mode constant current control scheme. The power conversion stage of the HV9961DB1 consists of a diode bridge rectifier followed by a buck converter operating with fixed off-time of 20μs. The HV9961DB1 LED driver features tight regulation of the LED current within a few milliamps over the entire range of the input AC line and the output LED string voltage. The HV9980B1 demoboard is an RGB or multi-channel white LED backlight driver designed to drive LEDs for a large-screen TV. The HV9980DB1 can drive three common-anode LED strings from a 100 - 140V input at currents up to 70mA in steady state. It can also drive the LEDs at currents as large as 160mA for short durations to facilitate backlight scanning mode. 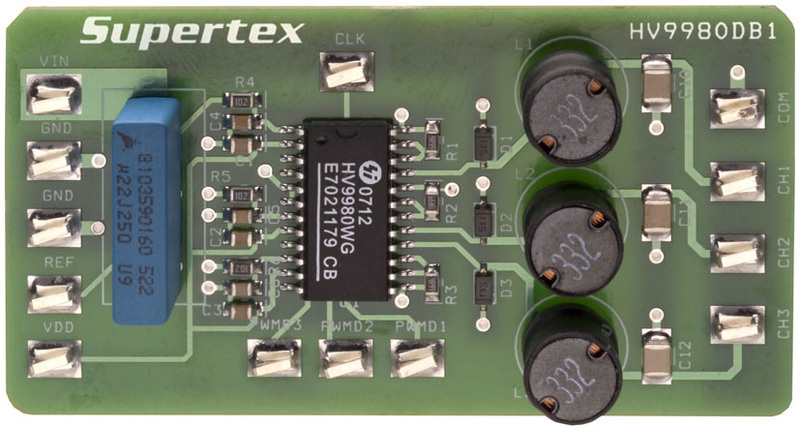 Each of the three channels can be individually controlled by PWM dimming. The demoboard is also protected from short circuit conditions across any string and recovers automatically once the condition disappears. The HV9967BDB1 demoboard is a high-brightness LED driver designed to drive 4 LEDs in series at currents up to 350mA from a 20 - 60V DC input. 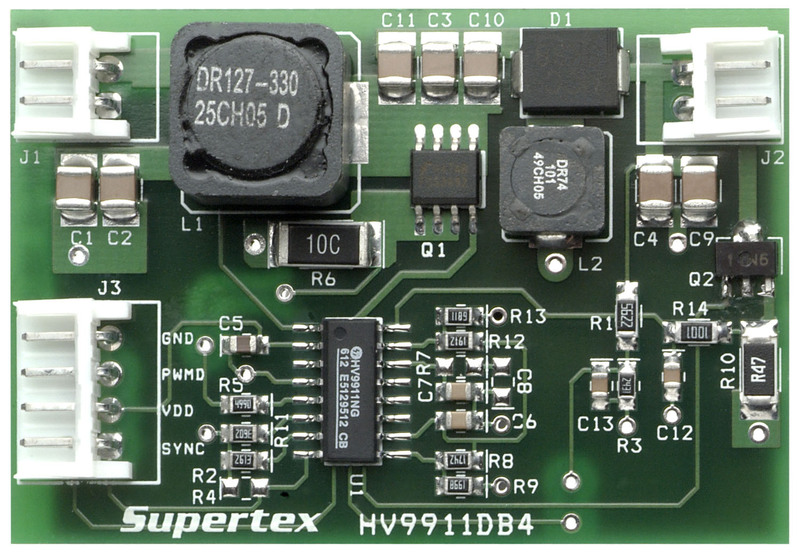 The demoboard uses the HV9967B in a buck configuration in a constant off-time mode. The HV9967BDB1 LED driver features tight regulation of the LED current within a few milliamps over the entire range of the input voltage (i.e. 20 - 60VDC). 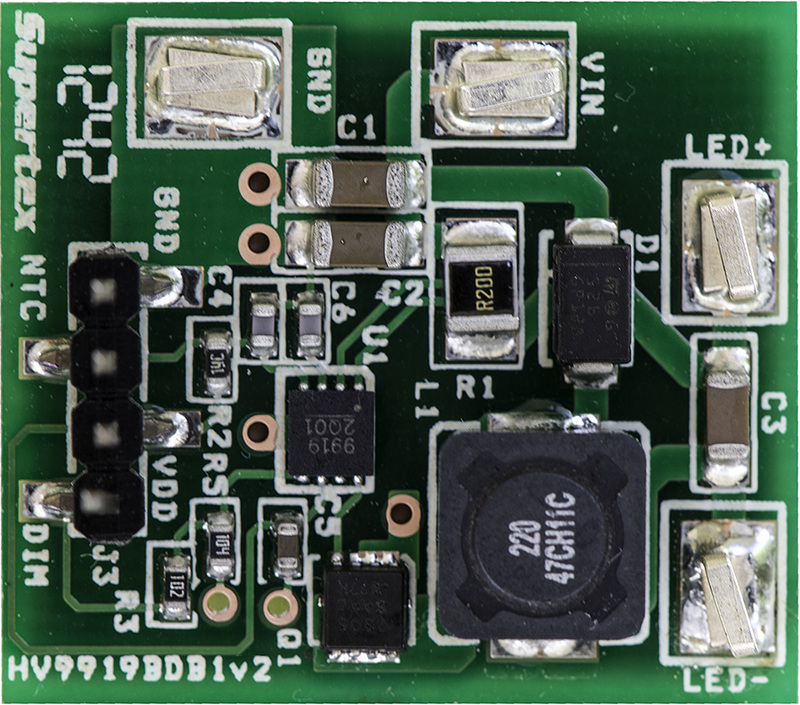 The AT9919BDB1 demoboard is a high current LED driver designed to drive one LED at 1.0A from a 9.0 - 16VDC input. 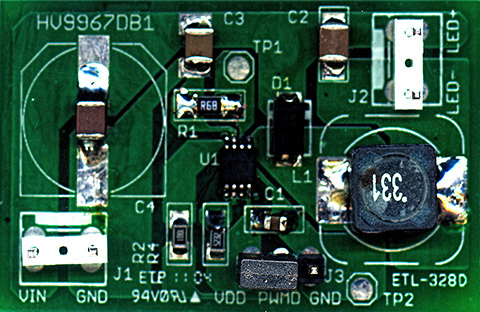 The demoboard uses an AT9919 hysteretic buck LED driver IC. The AT9919DB1 includes two PWM dimming modes. The analog control of the PWM dimming mode allows the user to dim the LED using a 0 - 2.0V analog signal applied between the ADIM and GND pins (0V gives 0% and 2.0V gives 100%). In this mode, the PWM dimming frequency is set to 1kHz on the board. The digital control of PWM dimming mode allows the user to dim the LEDs using an external, TTL-compatible square wave source applied between DIM and GND. In this case, the PWM dimming frequency and duty ratio are set by the external square wave source. The HV9930DB2 is a LED driver demoboard capable of driving 4 3-watt LEDs in series from an input of 9 - 25V DC. 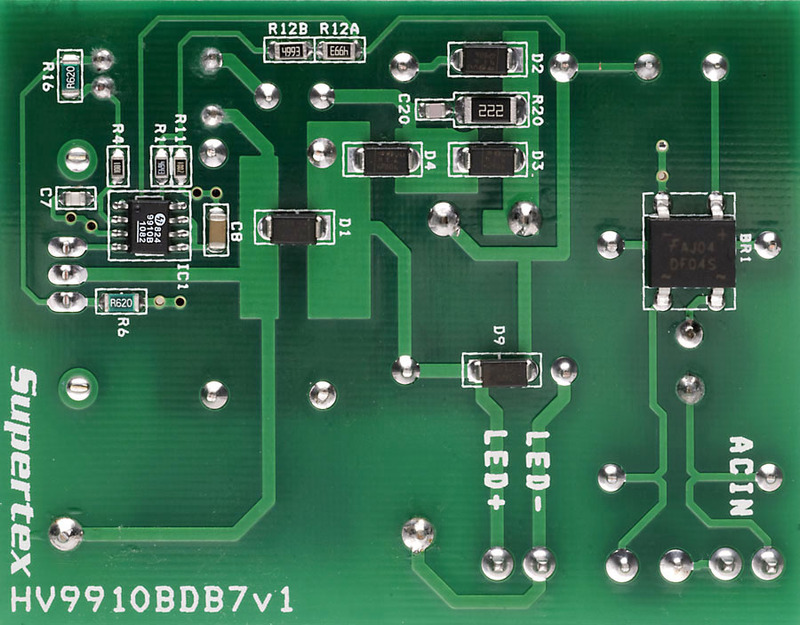 The demoboard uses the HV9930 in a boost-buck topology. The converter has excellent line and load regulation over the entire input and output voltage range. The full load efficiency of the converter is typically greater than 80%. The converter is also protected against open LED and output short circuit conditions. The HV861DB1 demoboard contains all the necessary circuitry to demonstrate the features of the HV861 dual EL Lamp driver. The AT9933DB1 is an LED driver capable of driving up to 7 1-watt LEDs in series from an automotive input of 9 - 16V DC. The demoboard uses AT9933 in a boost-buck topology. The converter operates at frequencies in excess of 300kHz and has excellent output current regulation over the input voltage range. It can also withstand transients up to 42V and operate down to 6V input. The converter is also protected against open LED and output short circuit conditions. Protection against reverse polarity up to 20V is also included. The HV816DB2 is a high brightness demoboard with the circuitry to drive a 10in2 EL lamp using the HV816 in a 4x4 QFN-16 package. The HV816DB3 is a demoboard designed for high power applications using the HV816 4x4 QFN-16 package. 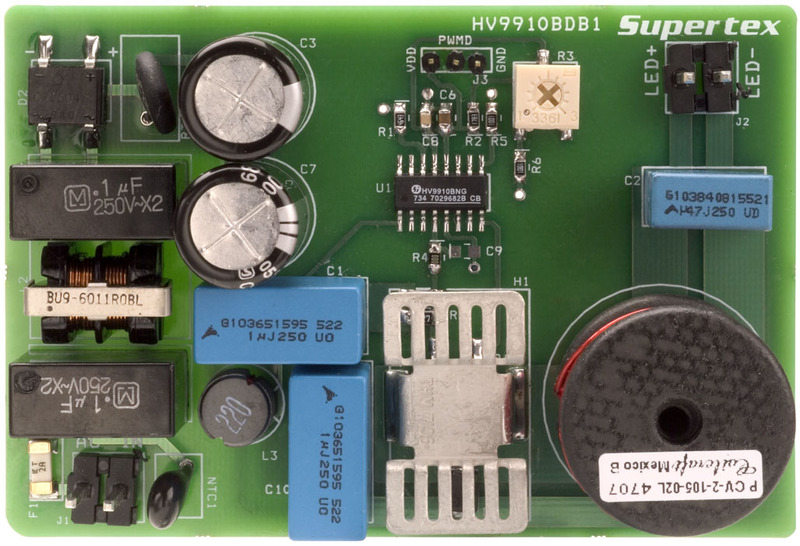 The HV9911DB1 is an LED driver capable of driving up to 20 one-watt LEDs in series from an input of 21 - 27VDC. 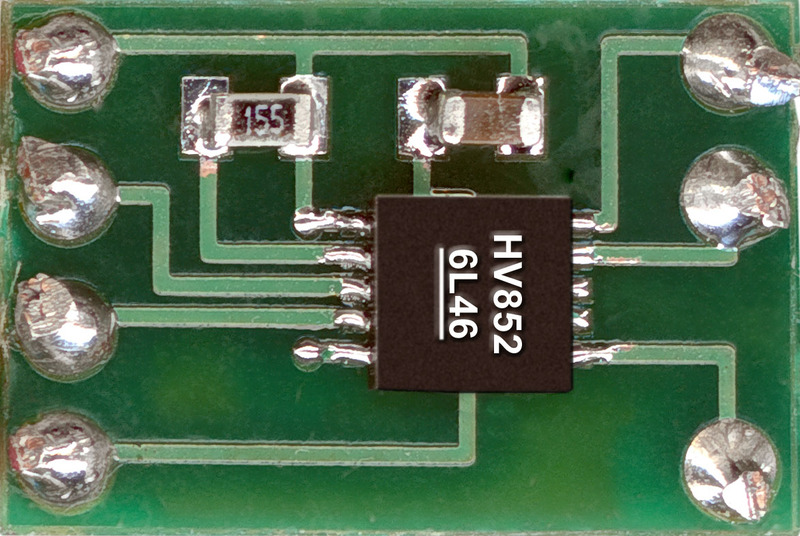 The demoboard uses HV9911 in a boost topology. The converter has a very good initial regulation (+/-5%) and excellent line and load regulation over the entire input and output voltage range (<+/- 1%). The full load efficiency of the converter is typically greater than 90%. The HV9911DB1 is also protected against open LED and output short circuit conditions. It is also protected under input undervoltage conditions by limiting the input current. It has an excellent PWM dimming response, with typical rise and fall times less than 2.0μs, which will allow high PWM dimming ratios. 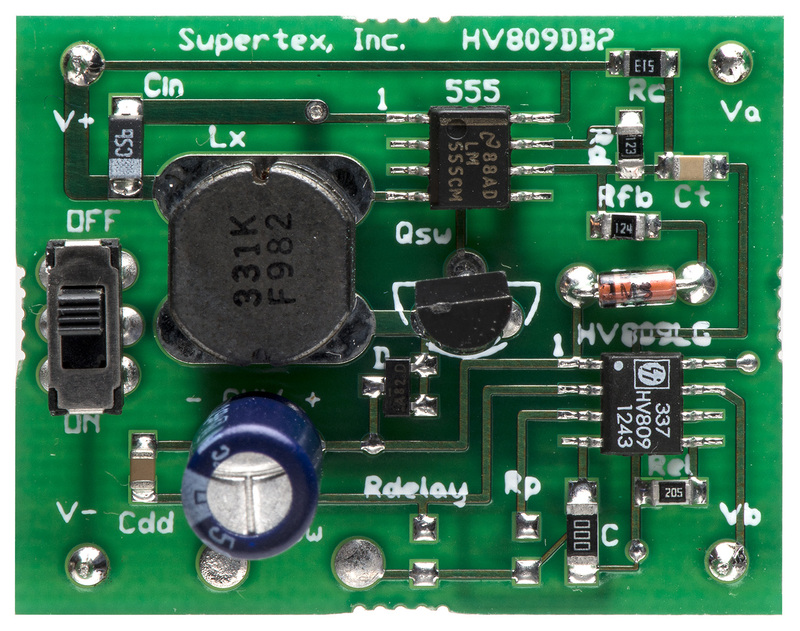 The HV852DB1 demoboard contains all necessary circuitry to demonstrate the features of the HV852 EL lamp driver. The HV809DB2 EL Driver demoboard contains all the circuitry necessary to drive an EL (Electroluminescent) lamp. 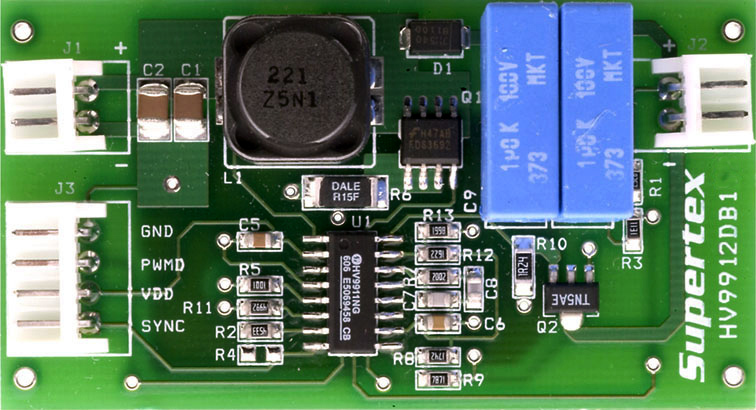 The HV853DB1 demoboard contains all the necessary circuitry to demonstrate the features of the HV853 EL lamp driver. 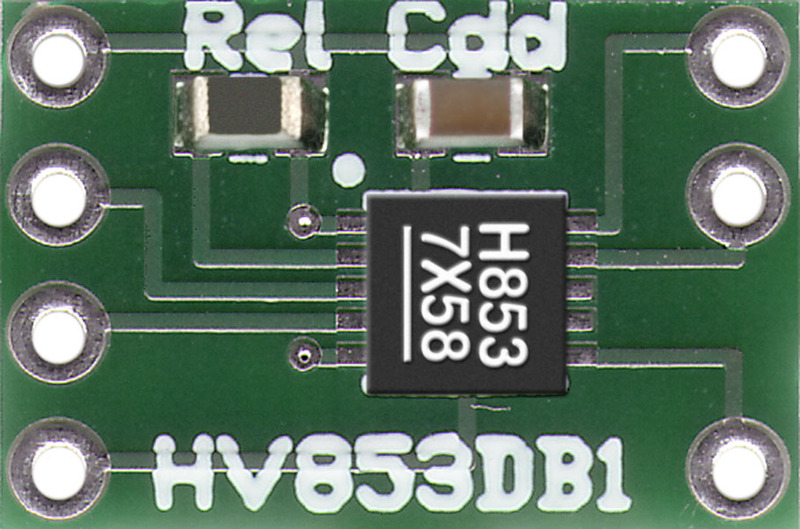 The HV853 is the low noise version of the EL driver HV852 with improved EMI performance. 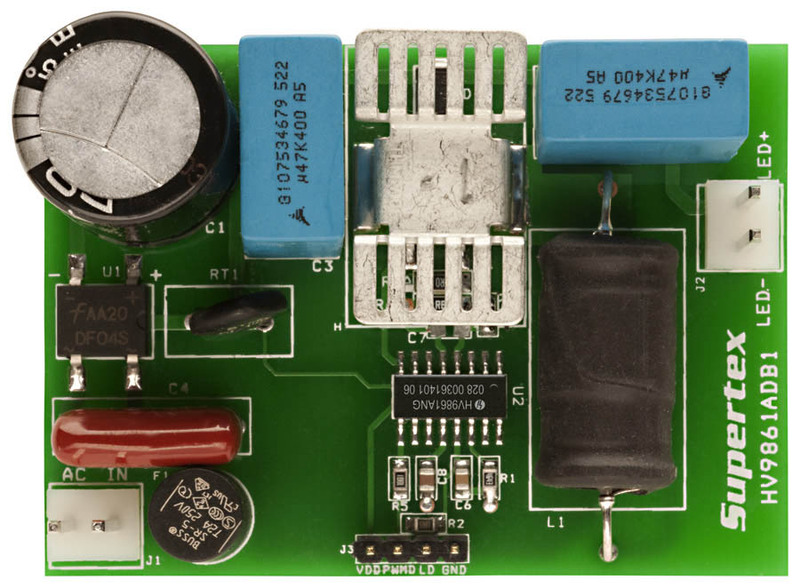 The HV857LDB1 demoboard contains all necessary circuitry to demonstrate the features of the HV857L EL lamp driver. The HV9910BDB2 demoboard is a High Brightness LED power driver to supply a string of LEDs using the HV9910B IC from a universal AC input. The HV9910BDB2 can supply a maximum output current of 350mA to drive 10 - 40V LED strings from a wide input voltage - 90 to 265VAC, 50/60Hz. The power conversion stage of the HV9910BDB2 consists of a diode bridge rectifier, followed by a current-controlled buck converter operating at a switching frequency of 50kHz. 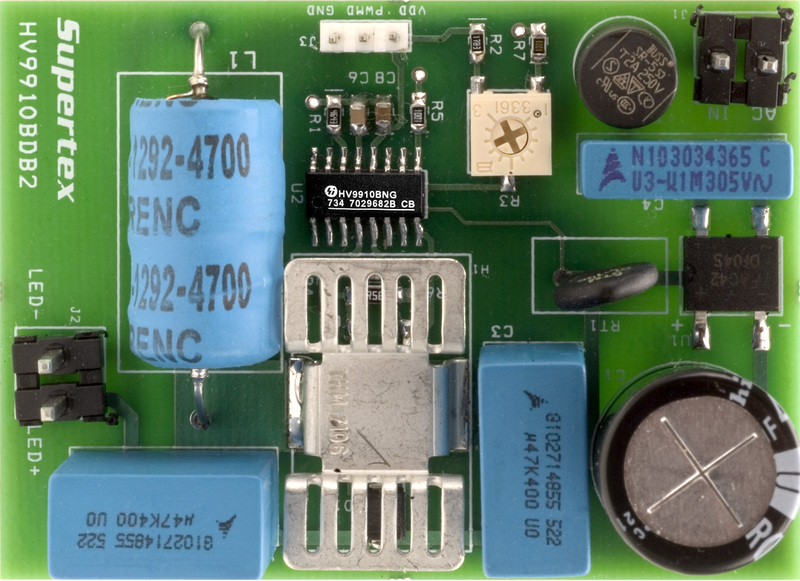 The nominal output current of the demoboard can be adjusted to any value between 30 and 350mA using the on-board trimming potentiometer. PWM dimming can be achieved by applying a pulse-width-modulated square wave signal between the PWMD and GND pins. Zero output current can be obtained only by PWM dimming. The HV9910BDB2 is not CISPR-15 compliant. Additional filtering is required to make the board meet CISPR-15 limits. The HV9911DB2 is an LED driver capable of driving up to twenty 100mA LEDs in series from an input of 9 - 16V DC. 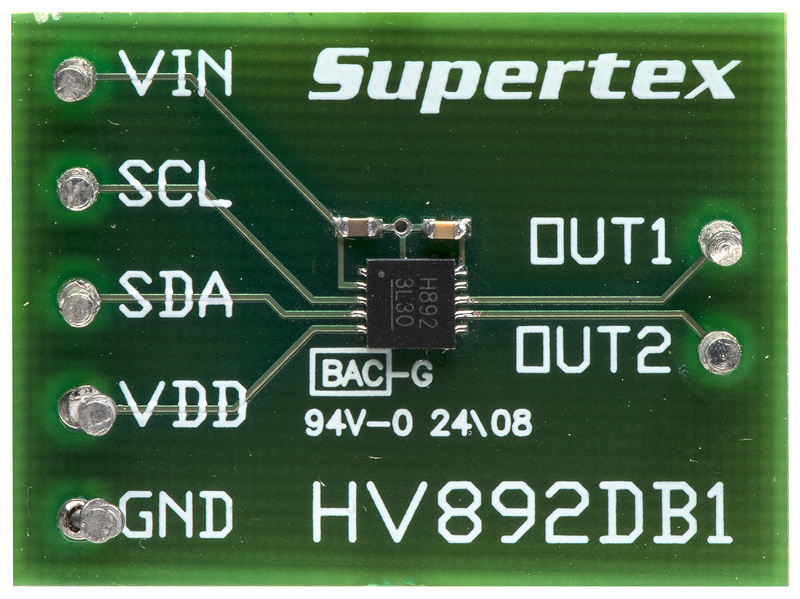 The demoboard uses Supertex’s HV9911 IC in a boost topology. The converter has a very good initial regulation, (+/-5%), and excellent line and load regulation over the entire input and output voltage range (<+/- 1%). The full load efficiency of the converter is typically greater than 85%. The HV9911DB3 is an LED driver capable of driving up to 25 one-watt LEDs in series from an input of 130 - 200VDC. 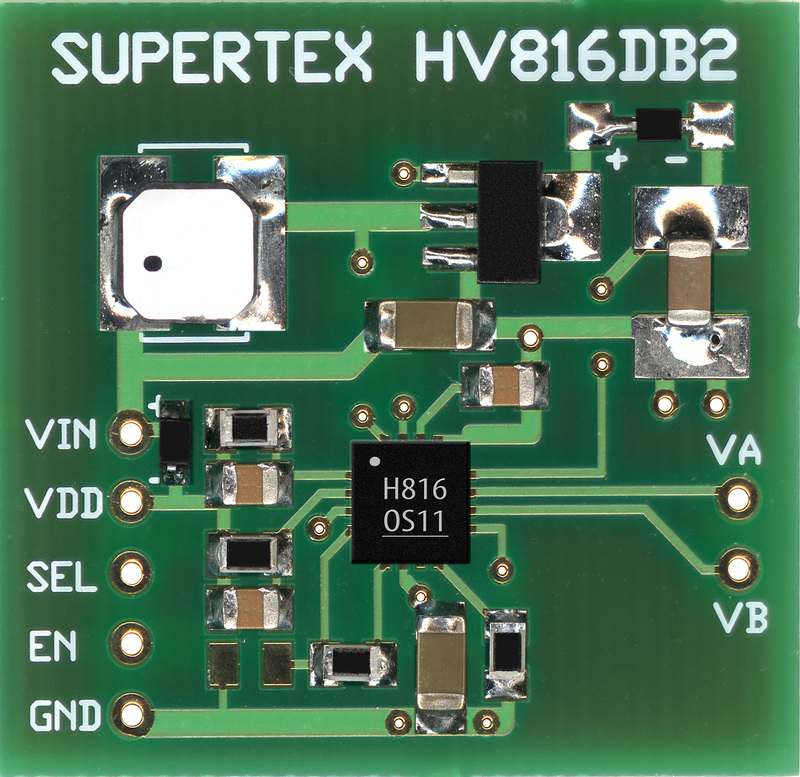 The demoboard uses HV9911 in a buck topology with the HV7800 used for high side current sensing. The converter has a very good initial regulation (+/-5%) and excellent line and load regulation over the entire input and output voltage range (<+/-2%). The full load efficiency of the converter is typically greater than 85%. 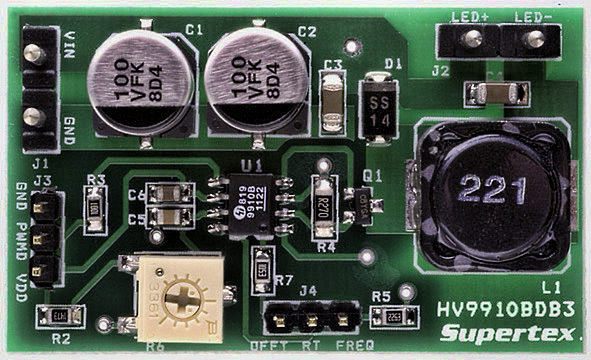 The HV9911DB4 is an LED driver dempboard capable of driving one to six three-watt LEDs in series from an input of 9.0 - 16VDC. The demoboard uses HV9911 in a SEPIC topology to drive LED string voltages higher or lower than the input voltage. The converter has a very good initial regulation (+/-5%), and excellent line and load regulation over the entire input and output voltage range (<+/-1%). The full load efficiency of the converter is typically greater than 85%. 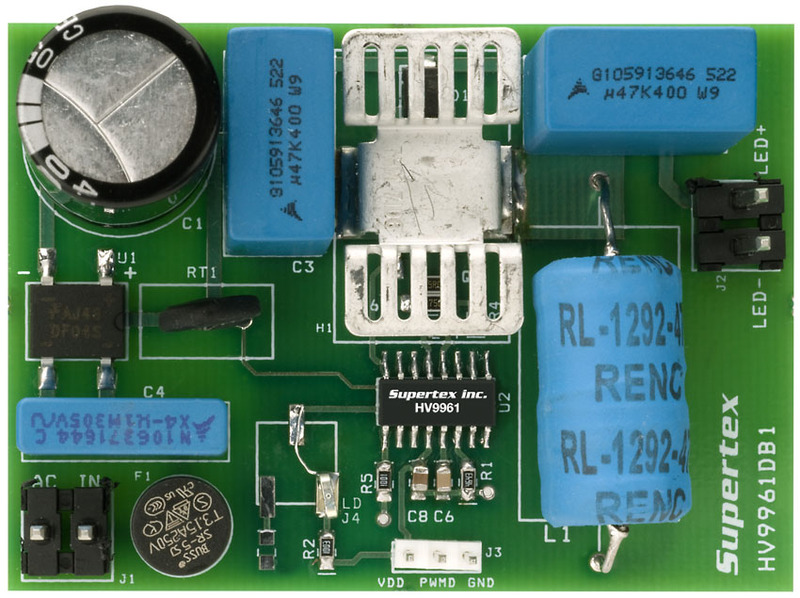 The HV9912DB1 is an LED driver demoboard capable of driving up to 20 one-watt LEDs in series from an input of 21 - 27VDC. It uses the Supertex HV9912 in a boost topology. The converter has very good initial regulation (+/-5%) and excellent line and load regulation over the entire input and output voltage range (<+/- 1%). The full load efficiency of the converter is typically greater than 90%. The HV9918DB1 demoboard is a high current LED driver designed to drive one or two LEDs at 700mA from a 9.0 - 16VDC input. 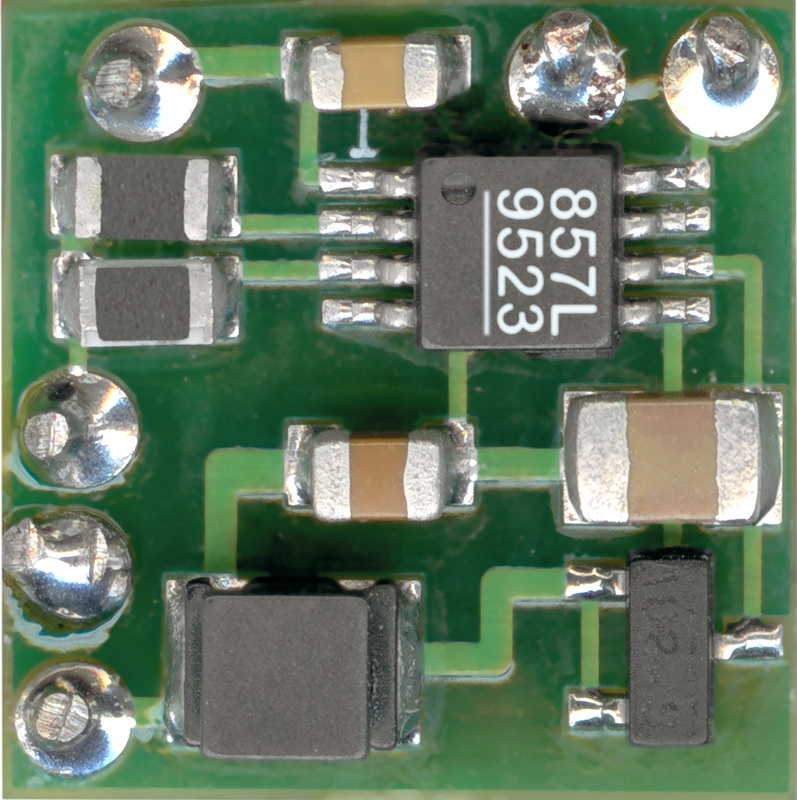 The demoboard uses HV9918 hysteretic buck LED driver IC. The HV9921DB1 demoboard is a complete LED power driver to supply a string of LEDs using the HV9921, an integrated 3-pin high input voltage constant-current buck regulator IC. The HV9921 integrates a 500V switching MOSFET and can operate directly from the rectified universal AC line voltage range of 80 to 265VAC. The HV9922DB1 demoboard is a complete LED power driver to supply a string of LEDs using the HV9922, an integrated 3-pin high input voltage constant-current buck regulator IC. The HV9922 integrates a 500V switching MOSFET and can operate directly from the rectified universal AC line voltage range of 80 to 265VAC. The HV9922DB2 is a universal input, offline, non-isolated auxiliary power supply using the HV9922 constant current switching regulator IC. The output voltage is regulated to 23V +/-5% and is referenced to the negative side of the diode bridge rectifier (i.e. ground of the rectified DC voltage). The HV9923DB1 demoboard is a complete LED power driver to supply a string of LEDs using the HV9923, an integrated 3-pin high input voltage constant-current buck regulator IC. The HV9923 integrates a 500V switching MOSFET and can operate directly from the rectified universal AC line voltage range of 80 to 265VAC. The HV9930DB1 is an LED driver demoboard capable of driving up to 7 1-watt LEDs in series from an automotive input of 9 - 16VDC. 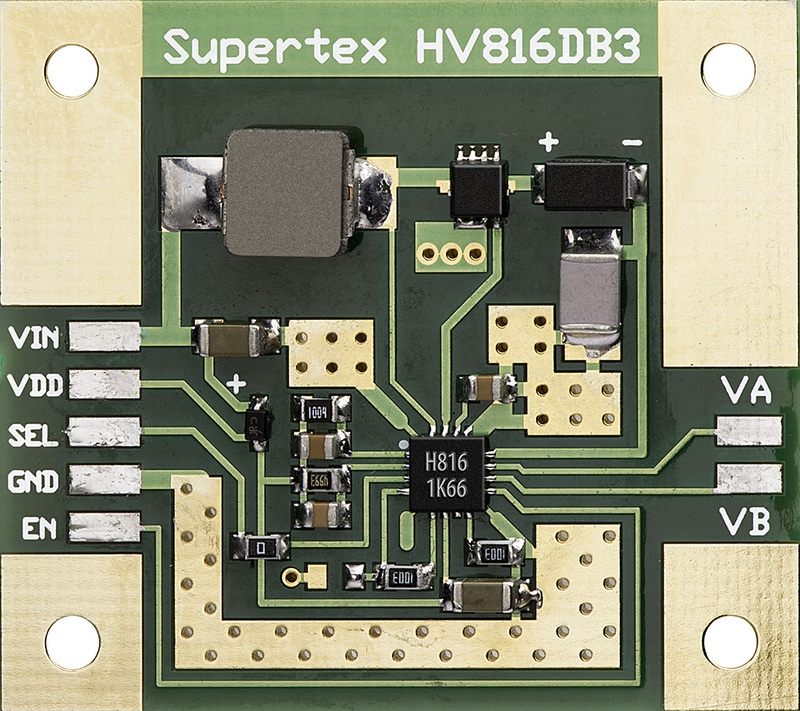 The demoboard uses the HV9930 in a boost-buck topology. The converter operates at frequencies in excess of 300kHz and has excellent output current regulation over the input voltage range. It can also withstand transients up to 42V and operate down to 6V input. The converter is also protected against open LED and output short circuit conditions. Protection against reverse polarity up to 20V is also included. 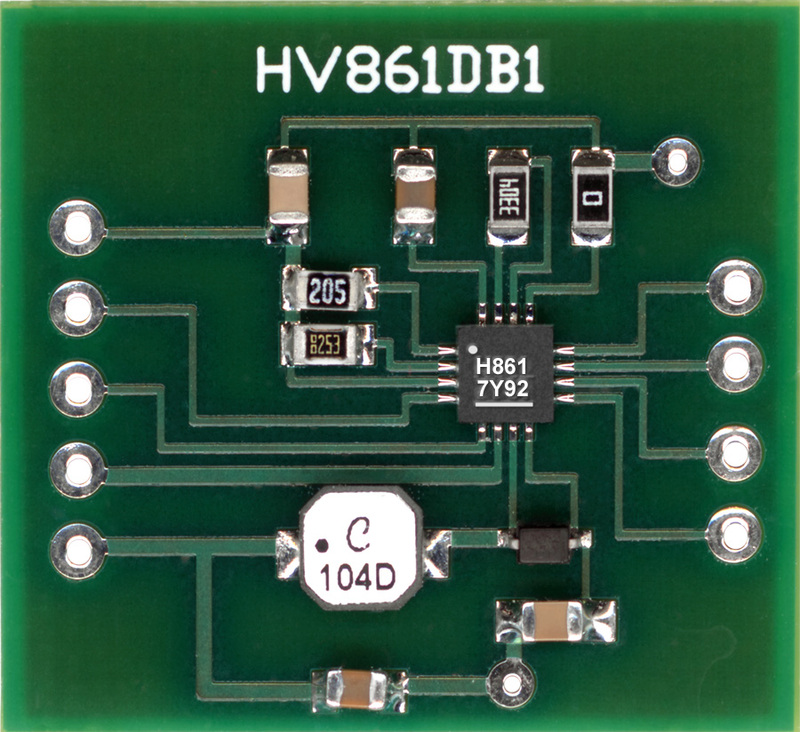 The HV892DB1 liquid lens driver demoboard is controlled via an I2C interface, is capable of driving capacitive loads of up to 200pF, and is compatible with 40VRMS to 60VRMS lenses. 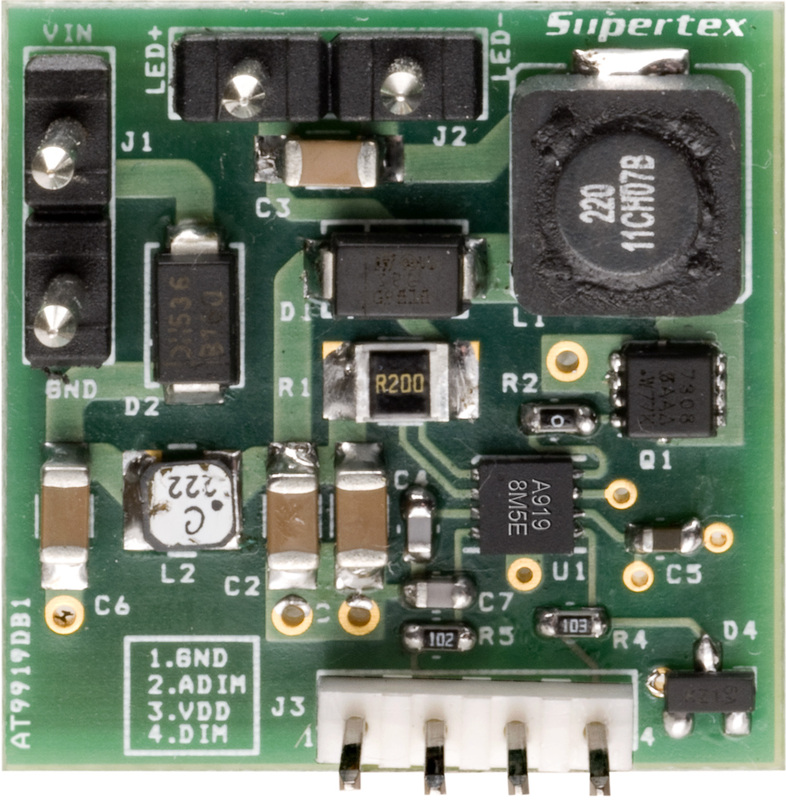 A charge pump boost converter integrated on-chip provides the high voltage necessary for driving the lens. No external inductors or diodes are needed. 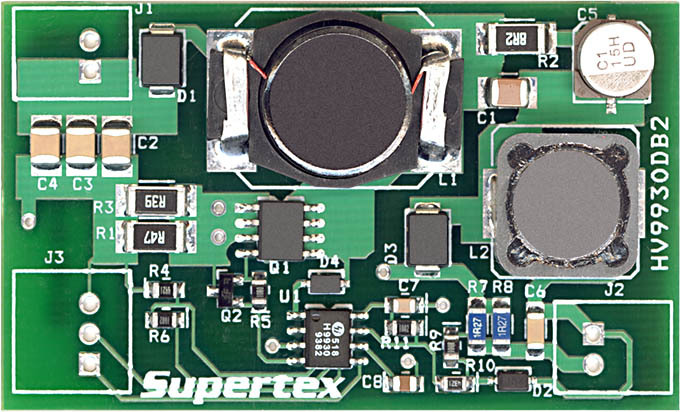 The board requires only two ceramic chip capacitors to complete a lens driver circuit. An H-bridge output stage provides AC drive to the lens, allowing the use of a single high voltage boost converter while providing alternating polarity to the lens. Controlled rising and falling edges on the drive waveform reduces EMI. The HV9931 LED driver is primarily targeted at low to medium power LED lighting applications where galvanic isolation of the LED string is not an essential requirement. 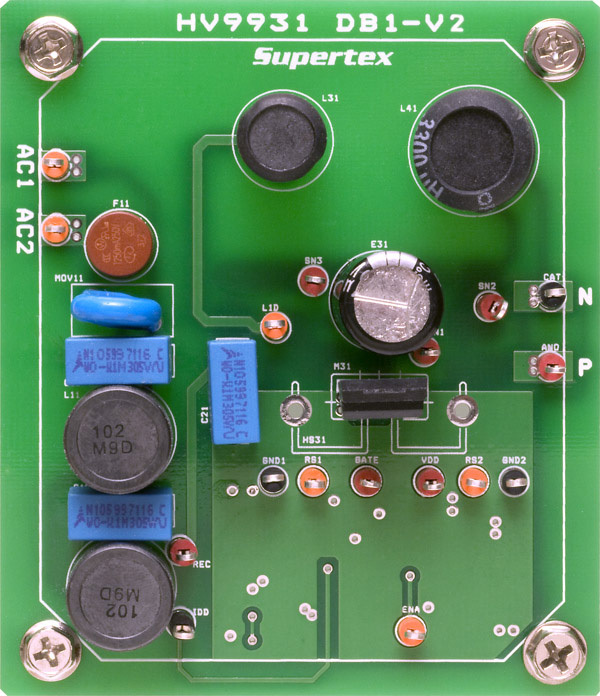 The driver provides near unity power factor and constant current regulation using a two stage topology driven by a single MOSFET and control IC. Triac dimming of this design is possible with the addition of some components for preloading and inrush current shaping. The HV9931DB2 demoboard is designed for a fixed string current of 350mA and a string voltage of 40V for a load power of about 14W. The board will regulate current for an output voltage down to 0V. 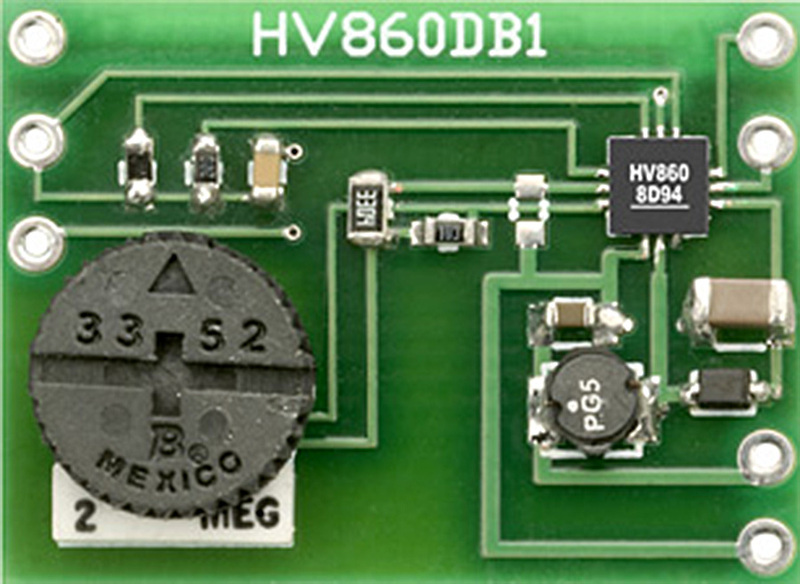 The HV860DB1 demoboard contains all necessary circuitry to demonstrate the features of the HV860 EL lamp driver. For EL lamp dimming, either a potentiometer or an N-channel open drain PWM signal can be used, but not both. 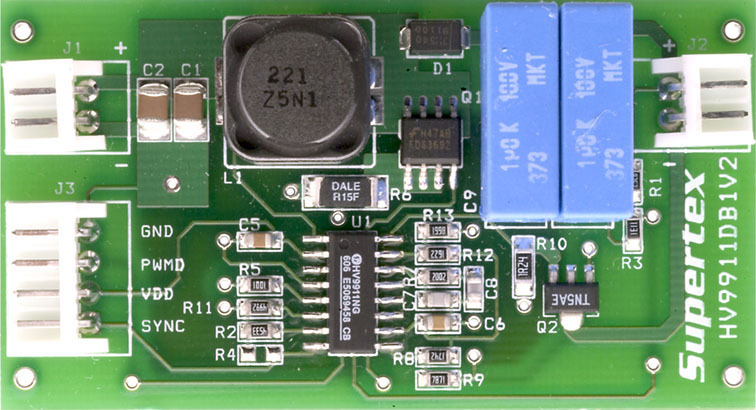 The HV857DB1 demoboard contains all necessary circuitry to demonstrate the features of the HV857 EL lamp driver. The HV9910BDB3 demoboard is a high current LED driver designed to drive one LED or two LEDs in series at currents up to 1.0A from a 10 – 30VDC input. 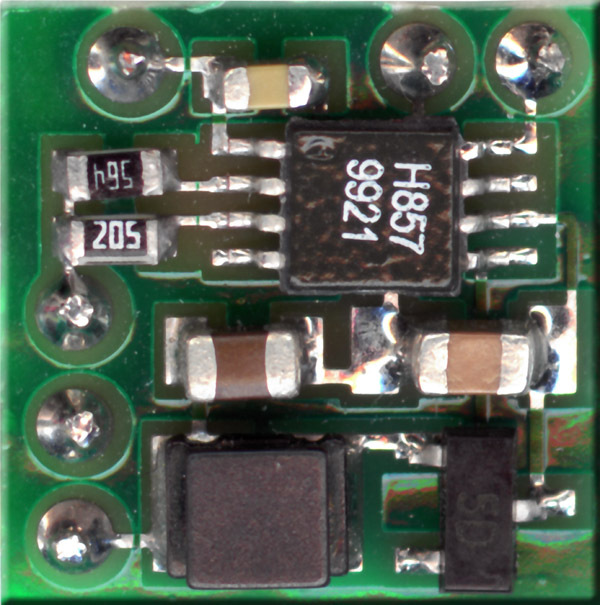 The demoboard uses HV9910B Universal LED driver IC to drive a buck converter. The HV9910BDB3 can be configured to operate in either a constant frequency mode (for driving a single LED) or in a constant off-time mode (for driving two LEDs). 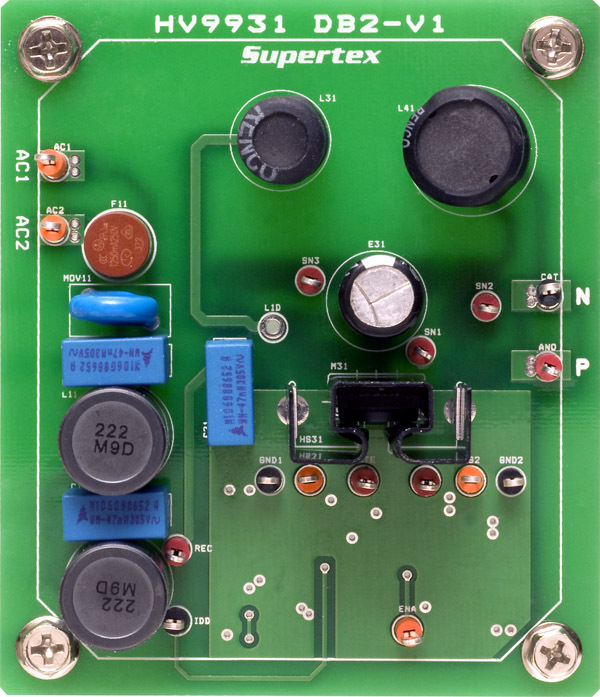 The output current can be adjusted in two ways – either with linear dimming using the onboard potentiometer or with PWM dimming by applying a TTL – compatible square wave signal at the PWMD terminal. Using linear dimming, the output current of the HV9910DB1 can be lowered to about 0.01A (note: zero output current can be obtained only by PWM dimming). 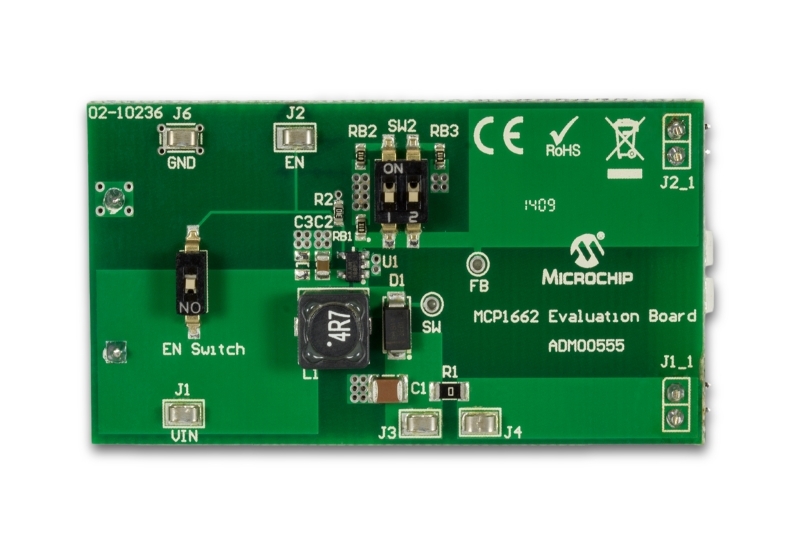 The MCP1662 LED Driver Evaluation Board is used to evaluate and demonstrate Microchip Technology’s MCP1662 product. 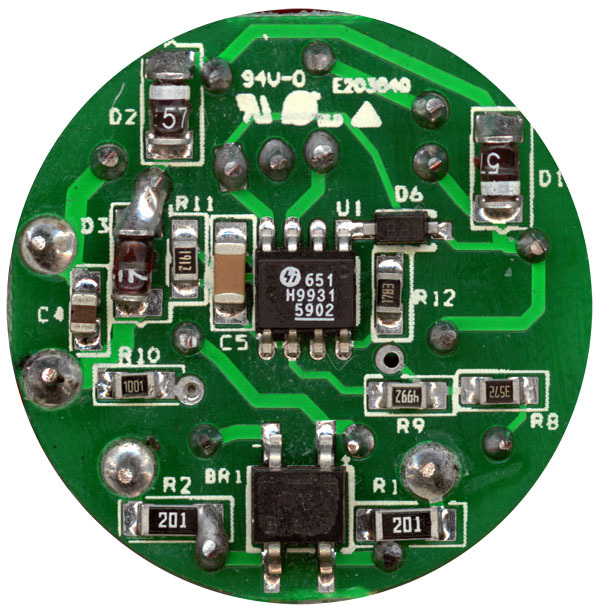 This board demonstrates the MCP1662 in a boost-converter application supplied by two AA batteries, or from an external voltage source, which drives a string of LEDs with three selectable currents: 30 mA, 60 mA and 90 mA. The output current can be changed with a dual switch that changes the external LED current sense equivalent resistance (RSET). An enable switch is used to enable and disable the converter. When enabled, the MCP1662 will regulate the output current; when disabled, the current consumed from the battery by the device is typically less than 20 nA. 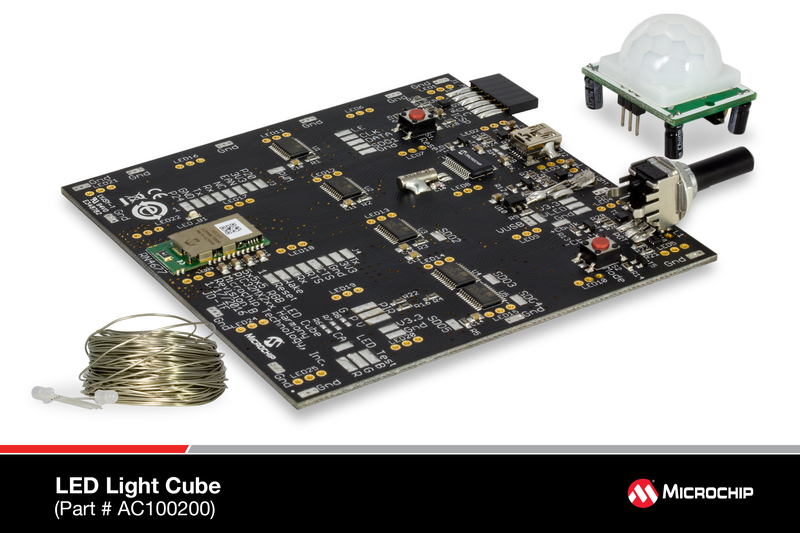 The HV9910BDB7 demonstrates the use of an HV9910B control IC in an off-line, High Brightness LED driver application. The board incorporates power factor correction (PFC) and satisfies the limits for harmonic currents according to the EN61000-3-2 Class C standard having total harmonic distortion (THD) less than 20%. 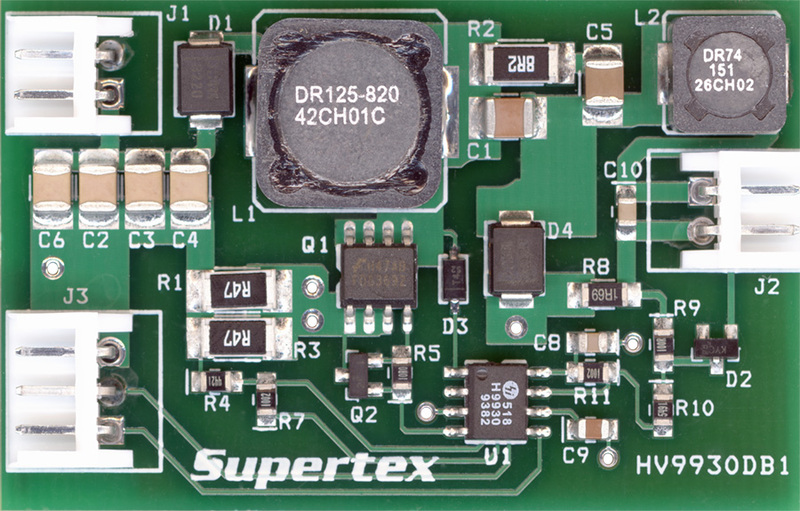 The board features a low component count and long life operation due to the absence of electrolytic capacitors. 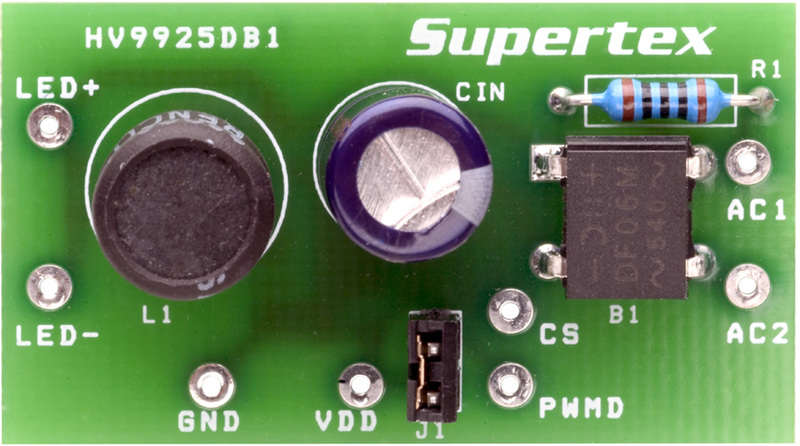 The board is designed to supply a string of LEDs with a current of 350mA and a voltage in the 65 to 105V range from a 220/230VAC line. The HV9925DB1 demo board is a complete LED power driver to supply a string of LEDs using the HV9925, an integrated, high-voltage, buck regulator IC featuring programmable output current and PWM dimming. The HV9925 includes a 500V switching MOSFET and can operate directly from rectified AC line voltages of 80 to 135VAC. 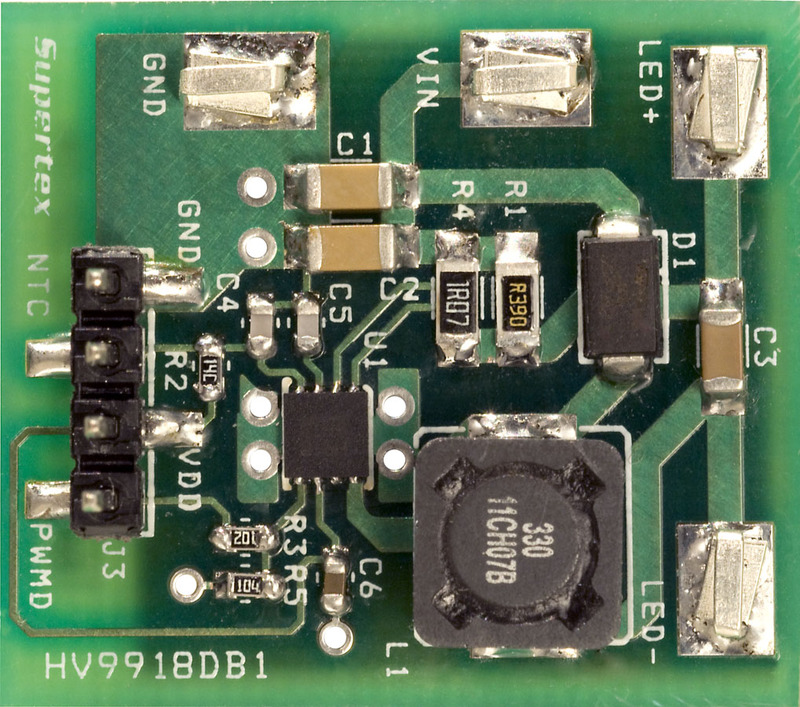 The HV9931DB5 demoboard is a high brightness (HB) LED power driver to supply one HB LED, using the HV9931 IC from either a 110 or 220VAC supply. The HV9931DB5 is ideal for incandescent retrofit applications, as it features a very small size and a low component count. 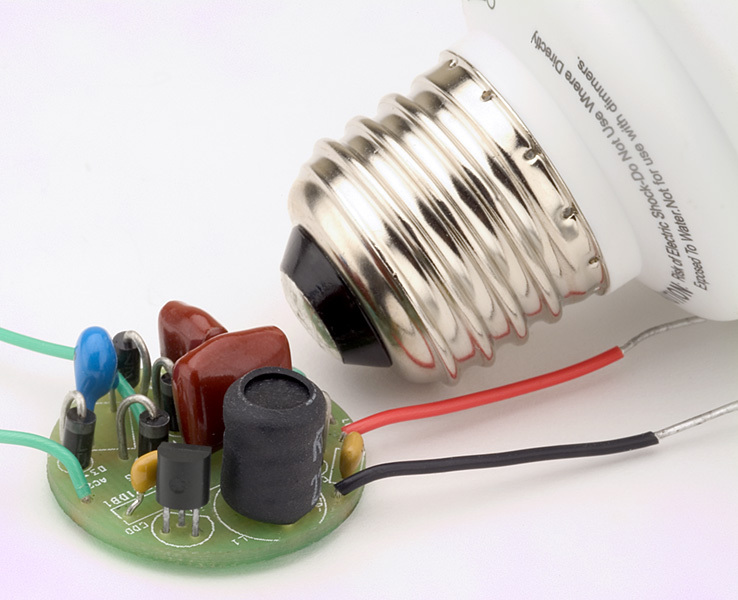 The HV9931DB5 avoids the use of electrolytic capacitors, which reduce the lifetime of the circuit in high ambient temperatures (which would be found in the base of a bulb). The demo board can be used to test the performance of the HV9931 as a constant current driver to power LEDs.